I disappeared down a Google-eyed rabbit hole for a good long while this past weekend after hearing about artist James Grashow and The Cardboard Bernini, an award-winning documentary by Olympia Stone. Grashow constructed an incredible corrugated Baroque fountain interpretation - a Grashow-Bernini, if you will, over a six year period with the intention that it would eventually be left outside in the rain and wind to disintegrate. Sound crazy? Not when you hear his thoughts on the creative process. The Cardboard Bernini Trailer from Olympia Stone on Vimeo. 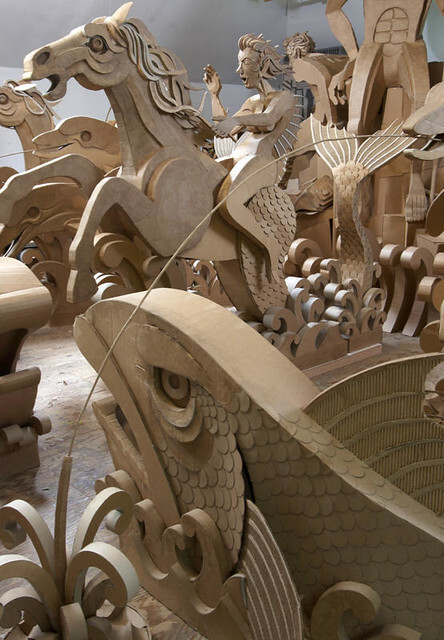 Grashow, a Brooklyn-born sculptor and woodcut artist, has a contagious enthusiasm for the sculptures that he cuts and shapes from cardboard, chipboard, and paper maché. 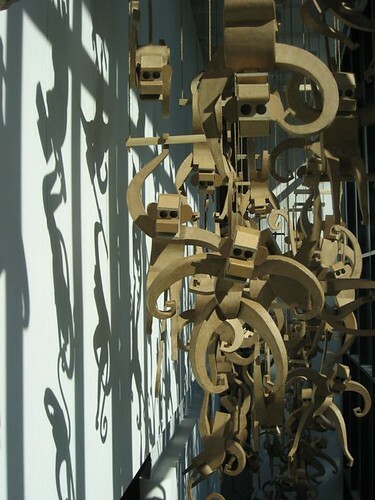 So contagious in fact, I think a trip to Wilmington, North Carolina is in order to see Corrugated World: The Artwork of James Grashow at Cameron Art Museum, on display through August 3. A community art project is involved and what a treat for those who participate... Jimmy, as he is known, is a natural-born teacher. Great Gulliver Project is an example of an installation created with university students, but he does educational cardboard workshops for any age group. "I am convinced there is a link between corrugated board and creativity. Its very valuelessness liberates us. Boxes, tubes, sheets of corrugated board - everything that lives between the good stuff and garbage - becomes a perfect partner for play." 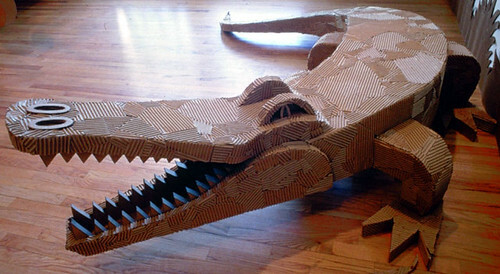 One of Jimmy's early forays into cardboard art was Yazoo - A Corrugated Menagerie, an environmental installation that included alligators, lions, tigers, a giraffe, gorilla, and more for the Aldrich Contemporary Art Museum in Ridgefield, Connecticut. Monkeys with toilet paper roll eyes (as seen in O magazine) went on to multiply and star in their own shows. Here they are in The Great Monkey Project, swinging over a stairwell at the DeCordova Musuem and Sculpture Park in Lincoln, Massachusetts. 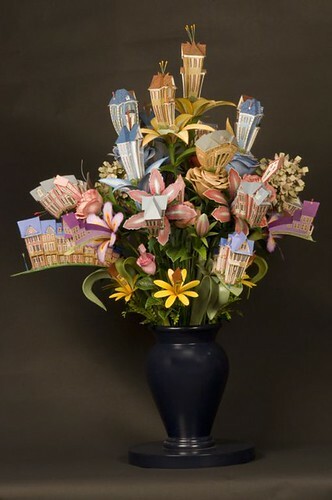 Lest you think Grashow doesn't work on a small scale, his series of remarkable flower arrangements, Houseplants, burst forth with intricate structures that depict "the fragile relationship between nature and man." 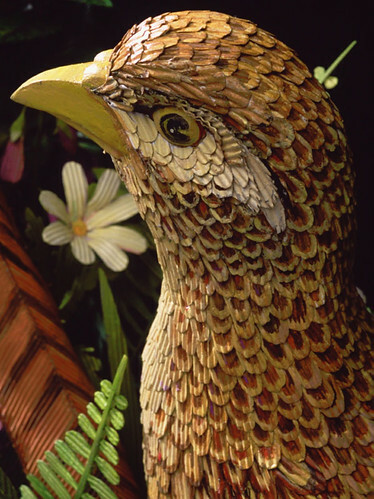 Stunning Cardbirds, inspired by James Audubon prints and made from corrugated cardboard and twist ties, speak to "a unique dimensional vision. The birds and their habitat - timeless and beautiful - are married to the most banal and overlooked of materials." 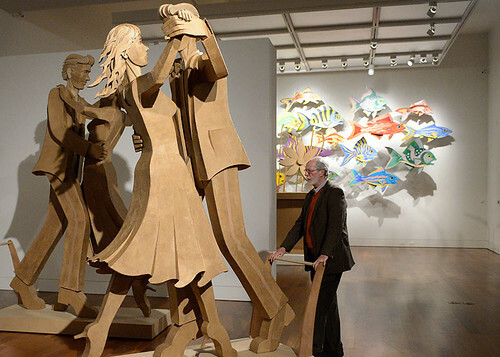 James Grashow's website and The Cardboard Bernini. Absolutely incredible. I cannot even name a favourite piece. They are all wonderful! 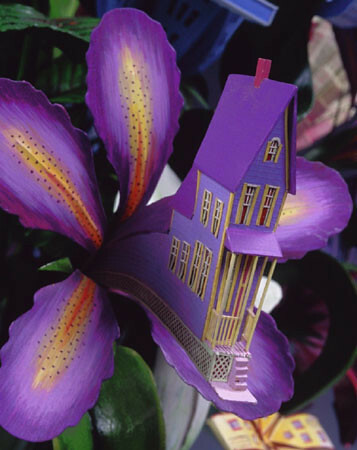 Thank you Ann for introducing me to yet another amazing paper artist! oh wow, really awesome work, thanks for sharing !!!! Amazing bird, and gorgeous purples. Fascinating! 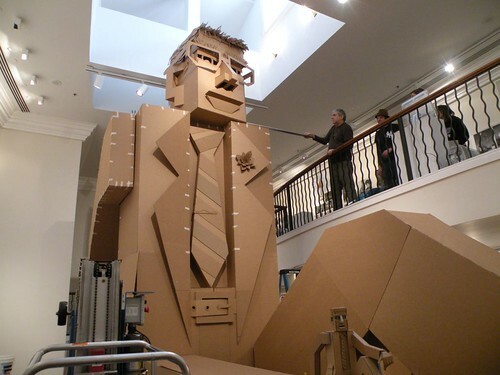 I used to love working with corrugated cardboard, but he takes it to a whole other level. Thanks for sharing this Ann. Such a beautiful post Ann.The card bird looks stunning. Very difficult to understand that such a masterpiece created over six years can be left to disintegrate . Thanks for your comment, Melissa - how nice. I definitely had the sense that was the case, just from watching clips of the documentary and reading articles about him. I like his work but I think it's its value that would liberate us. Even cardboard isn't worthless.